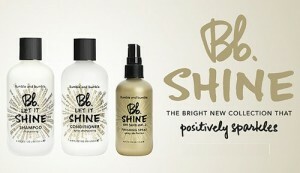 We’re excited that Bumble & bumble’s new ‘Shine’ products have hit our shelves. We’re stocking the Let It Shine Shampoo and Conditioner. Both focus on delivering high SHINE without weighing hair down. They’re sunflower based which helps remove dulling residue and preserve natural oils to let hair sparkle. And they’re suitable for all hair types and even colour treated hair. So if your locks have been feeling a bit lackluster recently, give them a go. Shine bright!